A clique (pronounced, "kleek") is a group of nodes that share access to the same disk arrays. Each multi-node system has at least one clique. The cabling determines which nodes are in which cliques -- the nodes of a clique are connected to the disk array controllers of the same disk arrays. When the node fails, the Teradata Database restarts across all remaining nodes in the system. The vprocs (AMPs) from the failed node migrate to the operational nodes in its clique. The PE vprocs will migrate as follows: LAN attached PEs will migrate to other nodes in the clique. Channel attached PEs will not migrate. While that node remains down, that channel connection is not available. Disks managed by the AMP remain available and processing continues while the failed node is being repaired. Vprocs are distributed across all nodes in the system. Multiple cliques in the system should have the same number of nodes. The diagram below shows three cliques. 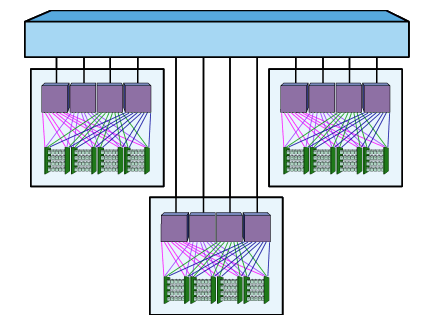 The nodes in each clique are cabled to the same disk arrays. The overall system is connected by the BYNET. If one node goes down in a clique the vprocs will migrate to the other nodes in the clique, so data remains available. However, system performance decreases due to the loss of a node. System performance degradation is proportional to clique size.